TIGI Bed Head Hard To Get's round, cyan packaging is unquestionably quirky and fun you'll definitely want to take one home with you! But with the relatively pricey tag that comes with it, is it really worth splurging on? Playin’ hard to get has never been so easy! This light, watermelon-scented molding paste texturizes and creates separation for a pieced out look that’s the epitome of cool. You do know how sorely different our hair looks like the day after our visit to the salon, don't you? With the TIGI Bed Head styling paste and a hair dryer, I honestly can recreate that fresh-from-the-salon look any time of the year! I have shoulder-length, thick hair styled into a slightly layered cut and this product helps a lot in letting me mimic the look Ron did when I visited him for a cut. I found great use for Hard To Get when going for an edgier look for my fringe or wanting to stylishly emphasize my layers by adding texture to them. On a very objective basis, one will definitely fall in love with its basic ingredients: Rosemary Leaf (improves oily hair), Matricaria Flower Extract and Soy Milk (moisturizers), and Beeswax (creates thickness, texture and separates hair strands). The opaquely white paste disintegrates well when properly rubbed against the hair. It is nothing sticky or oily on the scalp, too! The TIGI Bed Head Hard To Get Texturizing paste styles hair without damaging the hair and scalp. Girls with layered bobs and very short hair will have a great use for this; hair stylists will love the numerous looks this molder can create. However, the product's ability to style and hold hair is nothing new to most hair wax and pastes in the market and they even cost a lot less than this luxe hair product! 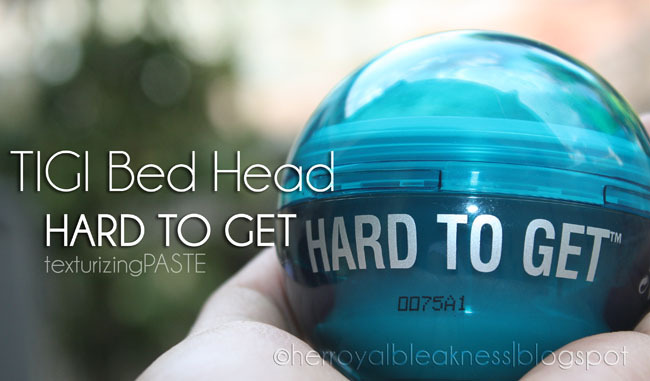 Full Disclosure: TIGI Bed Head Hard To Get texturizing paste was sent to me by ARC for review purposes. I have no affiliation with either TIGI or ARC. Mahal nga, mala-highway robbery. I'd spend that amount for foundation. I'm lucky I have manageable hair. P.S. Sobrang kamahal ng TIGI. Thank goodness low maintenance ang hair ko.